Water Hardness is an important parameter in water chemistry of an aquarium. By water hardness we mean that the water contains dissolved minerals such as calcium carbonate and magnesium sulphate. The hardness of the water depends on the source of the water. For instance, water from sources near limestone rocks will have high hardness levels. Water hardness will not soap easily. 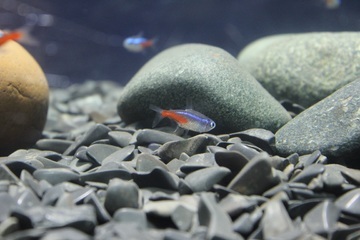 In Aquariums, each species has a specific water hardness it can tolerate. It is necessary to learn about a unique water hardness requirement of each species. Fish which are put in water that is too hard for them will die. Hard water can be transformed into Soft Water by special process such as osmosis. Passing hard water through materials such as zeolite will also make them soft. Try to learn about the hardness of the water in your locality when setting up your aquarium. Most common tropical species will adapt to common water hardness levels. Water hardness can affect the pH. The reverse, however, is not true. As hardness increases, the water becomes alkaline.